The AIRSTAK by ROLAIR is designed for the woodworker or finish carpenter that values portability and an organized work area. As a supplement to the Systainer® tool organization system, the 1 HP AIRSTAK portable air compressor is the perfect addition to your tool arsenal. Whether you use it in the shop or on the go, the AIRSTAK will stay safe inside the durable Systainer® T-Loc case. This 30 lb air compressor delivers 2.0 CFM at 90 PSI, all while drawing a mere 8 amps and humming away at only 70 decibels. 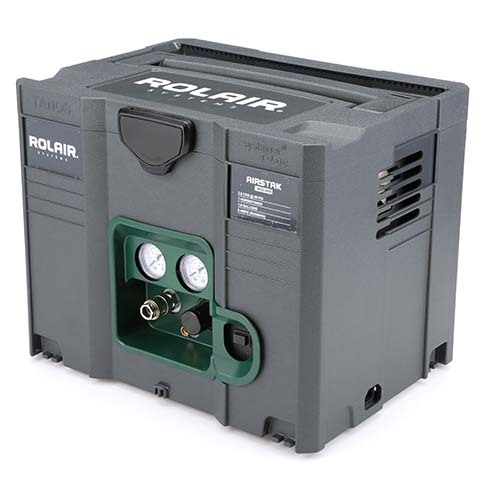 ROLAIR Quality, Single Stage, Oilless Pump Capable of Delivering 2 CFM @ 90 PSI. Lightweight - Only 30 Lbs.